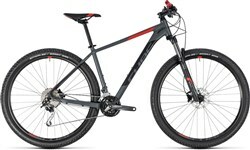 Versatile hardtail MTB performance for trail, track and road. 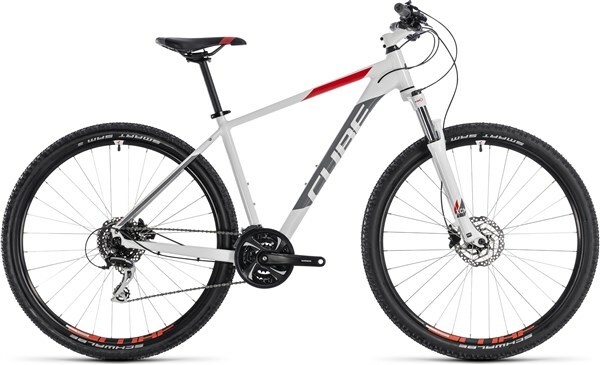 The Cube Aim Race offers true mountain bike performance with the versatility you need for urban cycling. At the heart of the Cube Aim is high-quality 6061 aluminium frame that features mechanically formed tubes which optimize strength without adding any extra weight. Offering the perfect balance of comfort and performance, the Aim features Agile Ride Geometry. This gives you neutral handling for confident off-road climbing and descending. Tidy details like internal gear cable routing keep the lines clean. This is a frame that wouldn’t look out of place on an MTB costing twice the price. The SR Suntour XCM suspension fork offers 100mm of suspension travel to smooth the bumps on the trail. A remote switch allows you to lock the fork out for more efficient cycling on smooth trails as well as on the road. Shimano hydraulic disc brakes deliver consistent stopping power for confident descending in all weather conditions. The Shimano 3x8 speed drivetrain offers reliable shifting with a wide range of gears for taking on all the climbs on the mountain. The 27.5” wheels give you perfect balance between nimble handling and rapid rolling performance although larger riders may prefer the Cube Aim Pro 29er. The Cube Aim Race 27.5 delivers a ride that is lively and comfortable as well as safe and efficient. Bought this, NO regrets... One proud owner. Looks great, handles well in my experience, and is a pleasure to cycle; can't fault it except for saddle which isn't the most comfortable. Bike used for general cycling, not tested on harder environments. first cube bike i have bought and its amazing decent spec and the frame is a beauty!